Your new movie Beyond the Wall of Fear - in a few words, what is it about? Beyond the Wall of Fear is an anthology of horror stories: Everything from weird experiments to an HP Lovecraft adaption to witches, monsters and crazed killers. I shot it over the course of just over a year, doing a segment every few months - there are eight stories in all. With Beyond the Wall of Fear being an anthology movie and thus tackling quite a few horror subgenres - is horror a genre at all dear to you, and some of your genre favourites and key influences? I love all kinds of movies, but horror and sci-fi are my favorite genres. My favorite movie is Phantasm. I love John Carpenter's stuff, David Cronenberg, Stuart Gordon and many many others. Often what I like about a movie is that it has its own character and feel, a 'vibe' I often call it, whether it is a quirkiness or a slickness or the dark humor or whatever, it's something that raises it above what might have otherwise been a stereotypical genre flick. What made you choose the anthology approach in the first place? As with almost all of my movies, there are multiple reasons why it developed in a certain way. For one, Madeline Morgan, an actress I had worked with many years ago (who then moved out of the area) popped up at a horror convention I was at in the spring of 2015 and it turned out I was going to be in her new town a few weeks later. I had finished several features in the last few years and did not yet have another project in the works but wanted to see if we could shoot something while I was there. I did an anthology way back at the end of the 1990s and for one of the segments, the original actress I'd written it for ended up moving. The guy whose house I was shooting half the movie at said he could get his neighbor to fill in so I went ahead with the scheduled shoot. Well, she did the best she could but was not really an actress and there were many other things about that short that I had to compromise on. It always kind of bothered me, so I decided to do a remake of that segment with Madeline and we shot it at her apartment in a matter of hours. At the time I figured I would either put the short up online or maybe work it into an anthology. Another influence was that I have attended the HP Lovecraft Film Festival in Portland, Oregon several times and have always thought about doing an adaption of one of his stories. I had a unique slant on The Statement of Randolph Carter that mixed in a bit of some local history, so that became another segment. 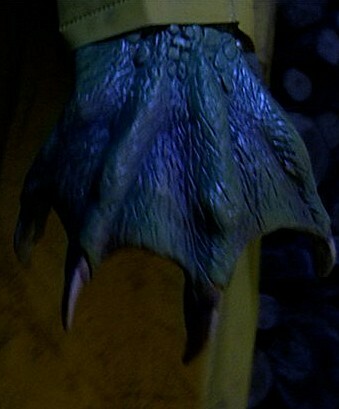 Also in 2015 I met Jackey Neyman Jones [Jackey Neyman Jones interview - click here], who played the little girl Debbie in the cult classic and Mystery Science Theater 3000 favorite (literally, during the 2016 Thanksgiving Marathon, fans voted it the #1 favorite episode) Manos The Hands of Fate, and discovered that she lived in a town just up the road from me! She said she was interested in being involved in a future project so I fleshed out an idea I had worked on a few years earlier and wrote it up for her and we shot it later that year. By this point, I had decided that I liked the break from features and would just continue to pull together a short every month or two and eventually assemble them all into an anthology. Each story called for something different. Carter was an H.P. Lovecraft adaption, so I wanted there to be the slow build-up and feeling of impending dread that is so essential to his stories. A few others were more of a build-up of suspense, broken up by a bit of humor here and there, like Curse of Pelican Bay and Walking the Dog. To be honest as the year went by and I was gathering these shorts, I realized that I was pretty short on blood, which is usually splattered with abandon in my other movies. So I made sure the last few I shot, 'Crazed' and 'Scanned' had several bloody scenes. Also, I found your movie quite amusing at times - so do talk about Beyond the Wall of Fear's brand of humour for a bit! I do tend to like working some quirky humor into my stuff, mostly situational or character-driven - I think it helps to give the characters just a little more depth and also is a nice way to break up or smash cut against scenes of horror to make things more interesting. I try to have fun on set, at least have a fun atmosphere. Even though there is often gruesome or intense stuff happening on screen, I am lucky enough to work with a lot of people who just love horror, love making movies, and that keeps the mood fun. Being that I write, direct and shoot, I usually know what I want and work with the actors to get it. Sometimes someone has a good suggestion and I take it if it works within everything else I want to do. But I think knowing what I want, editing in my head as I shoot, helps things move along quickly. I have read reviews where they say something along the lines of it seeming like the people making this movie must have had a good time, so perhaps some of that comes through even in the final product. I started offmaking movies with my friends and a lot of them have stuck around into this start of my third decade of making microbudget flicks. And that had lead to working with friends of friends. And then I’ve met people at screenings and at conventions who wanted to work with me. I have not gone the traditional route of holding auditions or things like that, I’ve just operated on a more casual level. I have been VERY lucky to have friends who I think are very talented! Some of the folks in Beyond the Wall of Fear I have known since middle school! And if you look over my last few movies, you can see that there is a bit of a family or ‘let’s put on a show’ feel as many faces turn up over and over again. I mentioned Jackey Neyman Jones [Jackey Neyman Jones interview - click here] earlier and this was her first movie with me. I was a producer and director of photography on Manos Returns with her this last summer and I am sure we will work together more in the future. I’ll just mention two other people I was really excited to get into the movie. Both George Stover and Tom Griffith were in The Alien Factor and Nightbeast which were a couple of low-budget sci-fi/horror movies from indie filmmaker Don Dohler. His movies were inspirational to me and I was lucky to correspond with him several times before he passed away in 2006. I was able to have George and Tom get their scenes shot where they live on the east coast and I cut them in with stuff I had shot here. George even wore the very same lab coat that he wore in The Alien Factor! I geeked out! Well it was really eight shoots and a few were multiple days. But as I mentioned, I try to keep things light on set, have some fun while working to make something entertaining to watch. On the Carter shoot, scheduling was tricky because people are so busy so I was pretty much locked into one date. And leading up to that date, the forecast was for a huge rainstorm. I checked with the guys to see if they were still willing to stick to the schedule and they were troopers. So we shot in the pouring rain and I mean POURING! We all got totally soaked. But in the end, I think it really added to the whole atmosphere of dread and so glad it rained! It would have had a totally different feel had it been sunny. For another segment, I had an actress who had to drop out 2 days before the shoot! Luckily another friend was able to step in at the last minute and threw herself into the role, literally throwing herself on the floor and against a wall! I used one house as three different locations for two segments. As The Curse of Pelican Bay begins, we see Jackey on the phone with her agent who tells her to go to a beach house he owns. We shot that upstairs in the house that she ends up traveling to for the rest of the segment. In fact, that house is nowhere near the beach! Months after that shoot, I drove an hour to the coast to get some footage of the beach and surrounding town. Creative editing plus some sound effects seems to have pushed the illusion. That same house was used for the witches story. I planned that so was just careful to shoot certain angles and in certain rooms for each. When Jackey is at the table on her laptop, the kitchen from the witches story is just offscreen! 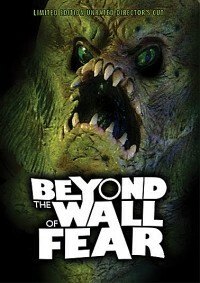 Anything you can tell us about critical and audience reception of Beyond the Wall of Fear? I premiered the movie at the Crypticon Seattle Film Festival in May of 2016. We had a very full room for a midnight show and people seemed to get a kick out of it and we had a good Q&A afterwards. The film was chosen for the Northwest Comicfest FIlm Fest in Salem, Oregon a few months later and again we had a good turnout. 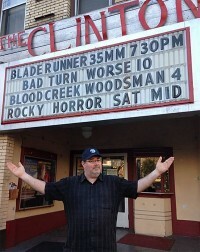 I screened it in Portland, Oregon at the indie-friendly Clinton Street Theater and finally at a local theater pub. I have gotten nice reactions and people have enjoyed the mix of horror with some tension and humor thrown in. So where can Beyond the Wall of Fear be seen, actually? You can pick up the DVD from http://www.skullfaceastronaut.com! 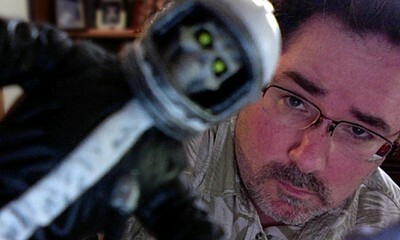 Right now I have been concentrating on writing some scripts, both for features and some shorts. Last summer I co-produced and was director of photography for Manos Returns, and that is currently in the last stages of post-production, so excited to see that play a few festivals in 2017. Several cast members from the original return and the director is my friend Seattle-based filmmaker Tonjia Atomic [Tonjia Atomic interview - click here]. What got you into filmmaking in the first place, and did you have any formal education on the subject? I mentioned Don Dohler’s The Alien Factor earlier and it was truly an inspiration. I caught it on an indie TV station not long after I had moved all the way across the country when I was 11 years old. I already loved science fiction and monsters, and here was a movie that reminded me of where I used to live (Don shot in Maryland and I grew up in New Jersey not far away). But the big thing was the amateurness (which I do find charming) made me feel like “I could do that!” I had drawn my own comics for years, so the leap to storyboards was not that great. I had shot some things with my dad’s super-8 film camera and then my friend John got a VHS videocamera and we made all sorts of skits and music videos and shorts. Years later after I had gotten out of college and run a comic shop for a number of years, I made a short feature inspired by The X-Files called Dimension of Blood. Soon I was selling homemade VHS tapes of my movies through Draculina Magazine and my website. John was also a writer and director and I was cameraman for all of the movies he made, while also making my own features. And I just have not stopped! No formal education. I have an art degree in graphic design and as I said had always drawn, but my film stuff has all been learned by just doing it. What can you tell us about your filmwork prior to Beyond the Wall of Fear? As I mentioned, I started shooting on VHS - my motto has always been do the best you can with what you have. I moved on up through various formats to shooting on HD today. I did a lot of movies with my friend John Bowker like The Evilmaker and Housebound and Platoon of the Dead. At the same time I was making stuff like Underbell (with a then-just-a-college-student Heather Storm, who is now on the Garage Squad TV show), Twisted Fates and Bloodsucking Redneck Vampires. My most recent stuff I’ve been quite happy with: Blood Creek Woodsman, Odd Noggins and Drifter. I think for the most part I am easy going. I can get worked up when things are going wrong but that does not happen too often. I do often have what I want in my head, so can usually adjust actors’ performances with just small suggestions or tweaks for emphasis, etc. Don Coscarelli is one - he is a guy who is very very kind, but knows what he wants; he does things his own way and his movies have their own feel to them. John Carpenter is another. Not only do I love his stuff, but he also puts a real flavor to his movies - they are unlike any other. The fact that he often writes his own stuff and scores it further adds to his projects really having his stamp on them. Don Dohler was an inspiration both as a filmmaker and a man. He did the best he could with what he had and his movies, while low-budget, had heart and his recurring cast gave it a small town put-on-a-show feel. Plus he loved monsters! As a man, Don helped out tons and tons of filmmakers and effects artists and was very open with sharing knowledge and advice. Fred Olen Ray would be another influence. Another fan of sci-fi and horror, Fred is another maverick who does things his own way, and early on worked through all sorts of hardships to just keep making movies. He also ran a great online bulletin board years ago and I got all sorts of knowledge through the conversations there, and was excited to finally meet and hang out with him in person recently. Too many to list, but a few are Phantasm, Star Wars, Battle Beyond the Stars, This Island Earth, Creature from the Black Lagoon, Dark Star, The Deadly Spawn, Prince of Darkness, Flash Gordon, Scanners, Lifeforce, Forbidden Planet, Blade Runner, but also stuff like The Last Wave, Singing in the Rain and Gregory’s Girl! You know what? Knowing how much effort it takes to make even a horrible film, I don’t want to necessarily list ones that I deplore. Other than that, the website and blog are the places to keep up with me. I’ve been making these microbudget movies for a long time and expect to continue making more, so for anyone interested, check ‘em out! Thanks for the interview, Mike, and thanks for keeping (re)Search my Trash going for so long!